Map with warning areas indicated from earlier today, Sunday. A high wind warning is more powerful than a gale warning. The winds are howling, the seas are building to 10-14’ and the rain was coming down in sheets earlier. Thankfully, the rain has let up for the time being, but a curtain call is predicted for tomorrow. All the elements are there for a classic nor’easter—and that’s what this is. This is the same system that is burying parts of western North Carolina and Virginia under a foot and a half and sometimes even two feet of snow. Five or six days out it was predicted to be a very powerful storm, and the snow forecasts for the mountains seem pretty accurate. Interestingly, though, there has been some real fluctuations in the Outer Banks forecast. 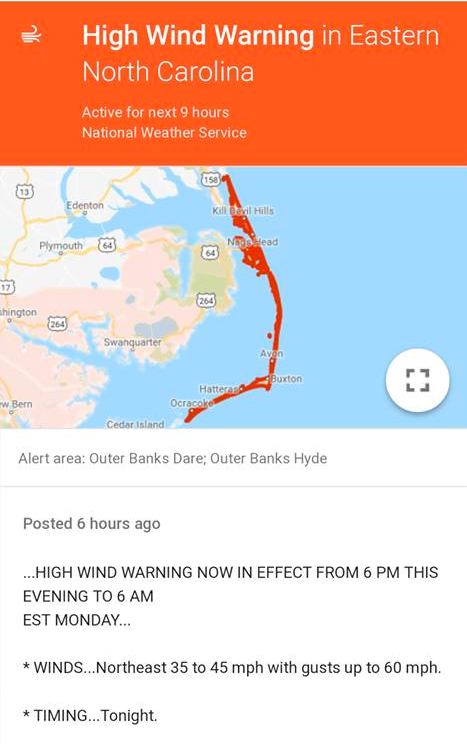 There was never any doubt that the winds would be blowing hard from the north and northeast, but sustained 50 mph winds recorded at the Field Research Facility in Duck—the Duck Pier—and in Kill Devil Hills were not a part of the original forecast. The forecast changed about six or seven hours ago to reflect stronger winds than originally expected—and yes, we are experiencing those winds right now. It will be interesting to see what things look like in the daylight tomorrow. We don’t expect any soundside flooding along the northern Outer Banks, but ocean overwash is predicted. If would be surprising if it did not occur in the areas that are prone to it. Tomorrow is looking a bit better than today, although a bit better is the best we can say at this point. The winds should come down a bit and there will be rain, but not the hard driving rain we had today. The rest of the week look very nice right now. Summer, Winter, Spring or Fall, the Outer Banks is an exciting place to visit. Check out our listings at Joe Lamb, Jr. & Associates for the best the Outer Banks has to offer.